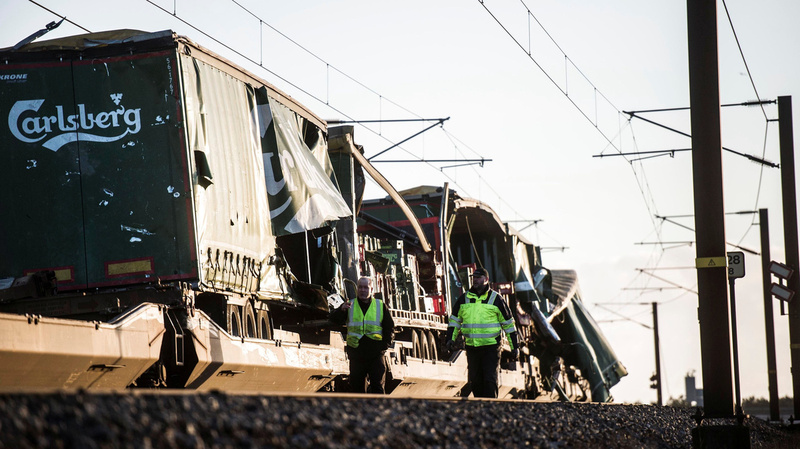 Death Toll Rises As New Details Emerge In Danish Train Accident Investigators believe the passenger train hit an empty truck trailer that was being carried on a freight train going in the opposite direction. Investigators say it could be months before they present a final report on a passenger train's accident on a bridge in central Denmark. Here, the train is seen covered by plastic in Nyborg, on Funen island. Two more people have died as a result of Wednesday's train accident on a bridge in central Denmark, police say, raising the death toll to eight. Investigators believe the passenger train hit an empty truck trailer from a freight train going in the opposite direction. Five women and three men died in the accident, authorities say. 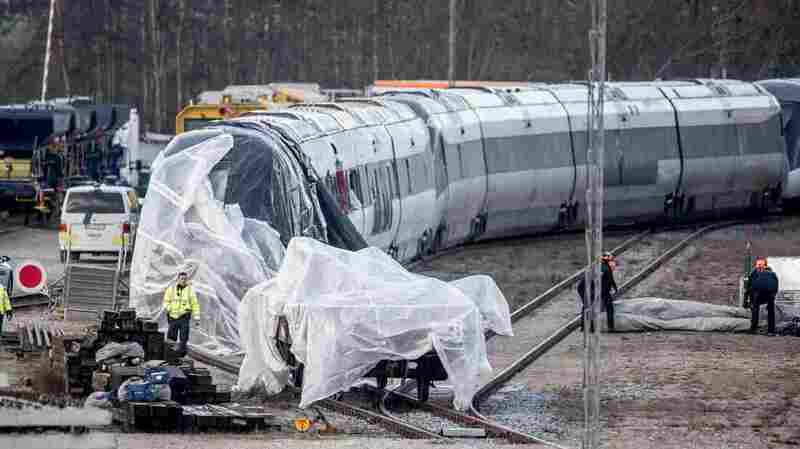 Most of them are believed to have been on the left-hand side of the train, according to the Danish Broadcasting Corp. The death toll had stood at six, but police say they found two more bodies as they explored the train. The number of people injured remains at 16. The light-rail train's left side sustained the worst damage in the accident, when it collided with a trailer that was falling off a freight car carried by the oncoming train, the Danish broadcaster said, citing preliminary findings from the Danish Accident Investigation Board. Investigators say they're still working to learn exactly how that happened. Danish media are calling it the worst train accident in 30 years. The crash happened shortly after 7:30 a.m. local time Wednesday, on the busy Storebaelt (or Great Belt) bridge and tunnel system that connects the islands of Zealand and Funen. That's where the passenger train encountered the freight train, with disastrous results. Investigators believe part of a freight train caused a fatal passenger train accident in Denmark on Wednesday. Here, the freight train is seen at the scene of the calamity on the Great Belt Bridge. Police in Funen have not released the names of those who were killed; 24 hours after the accident, they said they were struggling to confirm the identities of several bodies because of the intense violence involved. At this time, police investigators believe all of those who died are Danish nationals. The freight train had been carrying a load that included truck trailers laden with racks of Carlsberg beer bottles. The trains passed each other on the tracks near Nyborg, roughly 75 miles west of Copenhagen. In the hours immediately after the accident, it was believed that the passenger train was forced to brake hard because of something — reports cited items ranging from a tarpaulin to a piece of cargo — coming off the freight train. Images from the scene showed the passenger train suffered heavy damage to its nose — and also suggested that the train had not derailed, possibly avoiding a far worse calamity. The train is now sitting in a railyard in Nyborg. Train traffic on the bridge resumed Thursday morning, but only on one track, according to DSB, the Danish railway company. The accident damaged a network of power wires strung above the rails — including one stretch of more than 1,600 feet. Investigators say they're still gathering information and will face a long period of analysis and review. According to its website, the railway unit of Denmark's Accident Investigation Board consists of only three people: the unit chief, a senior investigator and an investigator.